Not your average recipe today! 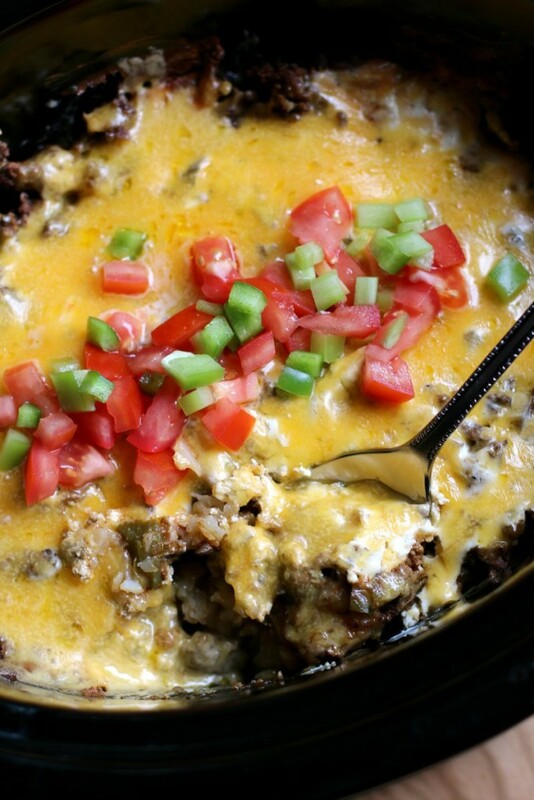 I made this drool worthy Slow Cooker John Wayne Casserole for dinner the other night. I’ve wanted to try an oven version of John Wayne casserole for years, but never got around to doing it. I thought, why not make it in the slow cooker? 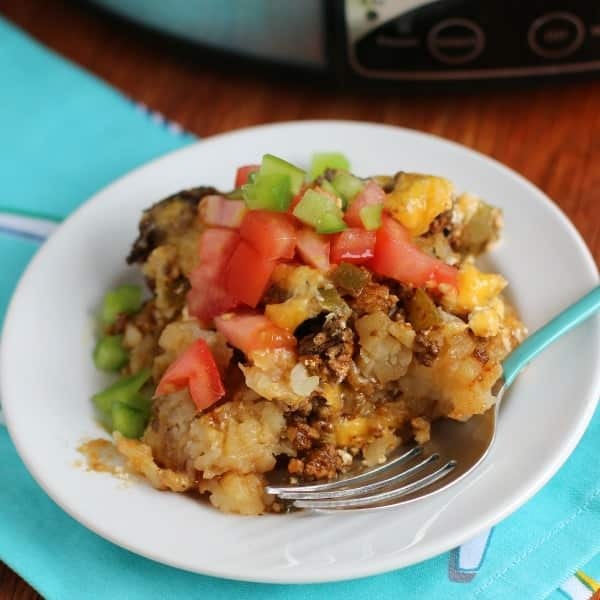 The original John Wayne casserole recipe that I’ve seen is made with biscuit mix, but one of the reviewers on Food.com said that she had a version of this casserole made with tater tots at a restaurant. BINGO! That’s how this recipe can be made perfectly in the slow cooker, with tater tots. I have a beloved standard tater tot casserole recipe that I adore on my site, so I knew exactly how to assemble this new creation. I started with a bag of tater tots in my slow cooker. Then I browned a pound of hamburger with bell pepper, onion and taco seasoning, I poured that meat mixture over the tots. Then I made a sour cream and cheese mixture with a bit of seasonings, and spread that on top of the meat. Cooked on LOW for 4.5 hours, and topped with more cheese, and I let that cheese melt. Then I served this delicious casserole with tomatoes on top. When I say this meal was the bomb, I mean it! I was seriously licking my plate! Try it, you’ll love it! I wanted to do a shout-out to my favorite cheese company Tillamook. If you ever visit the Oregon coast you must visit the Tillamook Cheese Factory! We do it once a year. Tillamook was a sponsor at the Indulge Conference I went to this last weekend. We arrived in our hotel room to find that Tillamook stocked our mini fridge with cheese! That was possibly the best gift ever. Update! I made a YouTube video of this recipe. I used Lawry’s taco mix in the video because the store was out of McCormick. You can follow me on YouTube here. Spray a 6-quart oval slow cooker with non-stick spray. Add the tater tots down in a single layer. Set aside. In a large skillet, set over medium high heat, brown the hamburger, onions and bell pepper. When the meat is browned, drain the fat. Add the amount of water the taco packet says to add to the meat (my packet said to add ¾ cup). Add the taco packet, and continue cooking and stirring until the meat and the seasoning has thickened. Pour the meat mixture over the tater tots in the slow cooker. 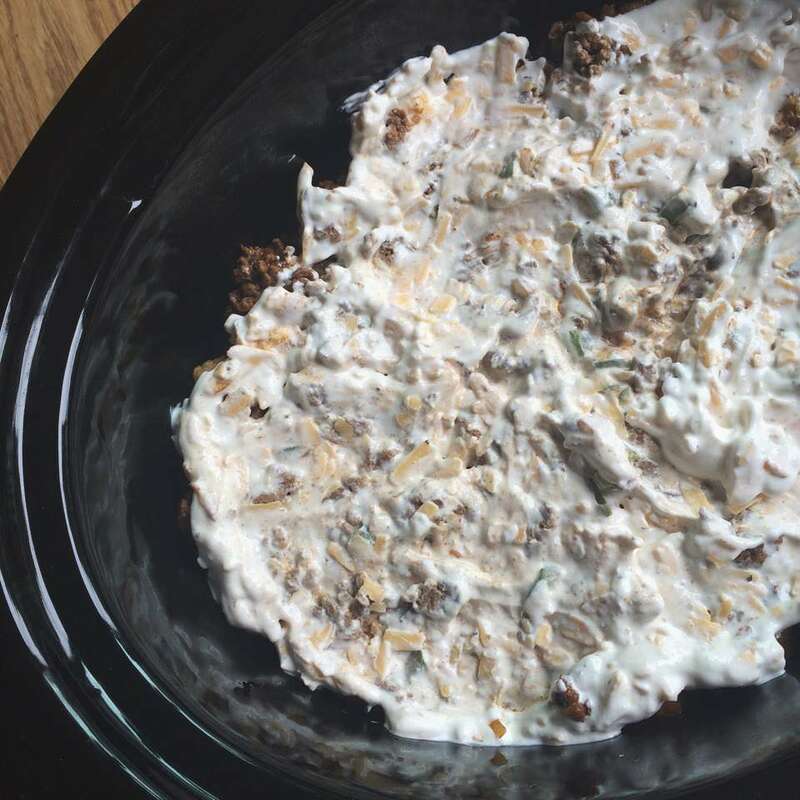 Spread this sour cream cheese mixture over the meat mixture in the slow cooker. Cover and cook on LOW for 4.5 hours, without opening the lid during the cooking time. After the cooking time is up add the remaining cheese evenly over the casserole. Cover and let the cheese melt, this will only take about 5-10 minutes. To serve, top with diced tomatoes. May i ask where are you from that you do not know what a tater tot is? So you thaw tater tots before putting in crock pot? I found out a few years ago, a person who does not cook makes a good proof reader for recipes. My husband asked questions I took for granted. He was great help..
yes! That would be really good for some heat! I only have a round cooker. How would I handle the tater tots portion using my cooker? Great question Jo Ann. This should work fine in a round cooker. You may be only able to use 3/4 bag of the tots depending on the size of your slow cooker. You could try layering. I have a round pot too, and stuff like this I just layer. Loving this! I love using my slow cooker for night’s when we have ball games and are getting home later, yet everyone is HUNGRY. Cannot wait to try! And super jealous you were at the Indulge Conference! I’ll be trying this! Tater tots are my favorite childhood food. This whole meal looks scrumptious! Such great comfort food. I would love a big spoon! Wow, this sounds delicious. I’ve never heard of John Wayne casserole. I bet it was amazing with Tillamook. cheese! This looks SO good! I love the name! My kids will add this to the favorites list! I LOVE tater tots and remind me so much of childhood yum! Pinned and shared! A great party dish for sure! I love the tatertots in the recipe and think they sound better than biscuits! 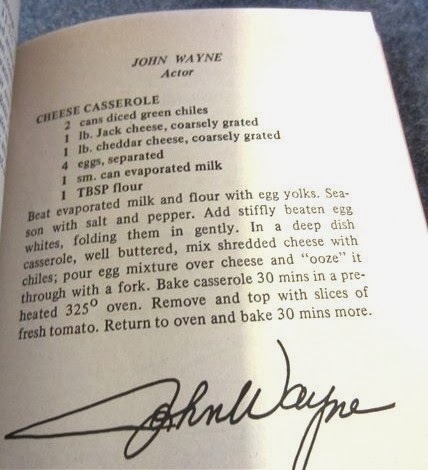 I’ve never heard of a John Wayne casserole, but it sure sounds delicious. I’m pretty sure John Wayne never ate a tater tot! Maybe whipped cream cheese. I’d try the whipped kind with chives. Could be interesting and add an extra kick. This looks fantastic!! We will have to try it soon! Great recipe! Can’t wait to try it. Sounds great. Kim, try subbing mashed potatoes for the tator tots and put them on top instead of the bottom. Another idea is to quarter sm red potatoes or new potatoes. Those, I would put on bottom. Kim, sub sm red potatoes or new potatoes, quartered, for the tatar tots. Or, use mashed potatoes on top. It’s yummy! This looks totally delicious. My family would love it! The tater tots are a great idea! It really does look delicious and since I live in Orange County – home of John Wayne and the John Wayne Airport I really should try it! Thanks. Have you visited John Waynes grave at Pacific View Cemetery ?You live in a beautiful area, I loved Newport Beach when we visited on vacation. Looks fantastic, thanks for the great recipe! would it be alright if I skipped the sour cream? sure It looks really good :)! It came out pretty good, the tots burnt a little but thats okay I like burned tator tots lol. couldn’t really taste the cheese unless it a was chunk, but I guess thats what the sour cream is for, I’d definitely make this again! 🙂 Thanks for the great Recipe! Couldnt I use frozen hash browns instead of tator tots. I’ve never tried them with this recipe. It may work good. Let me know if you try it and how it works out. Could you do this in an oven??? My family loved it. I will be making it again soon. Thinking if I do this will be with shredded hash browns, not Fondo tater tots. Let me know how it turns out. It definitely would cut down on the calories! I think a can of Ranch Style beans would be so good in this casserole!! It says single layer of tater tots, so does that mean do not use the whole bag? It’s the whole bag, I’ll fix that! This sounds so delish! I could see adding the fresh ingredients to the top: tomatoes, onion, any colored peppers and even lettuce … another plop of sour cream n hot sauce/fresh hot peppers! Give it a lil crunch with lettuce and other toppings! I could totally see your recipe that is over the tater tots over cornbread <southern thang! Or a fill in for lettuce wraps! Or in tortillas! As a dip with Scoops for dipping! Maybe add extra cheese for that plus a half can of refried beans for dipping consistency. OH at the possibilities! TY for sharing! DEFINITELY MAKING THIS VERY SOON! This is very similar to what I make, calling it my taco pie. I am gonna use shredded hash browns instead of tater tots. Will try it next Sunday at church potluck. I bet it will get eaten completely gone! I will be making this for sure! Can I shred potatoes And just put that on the bottom? Hi Deborah. I think the potatoes would turn brown, BUT I if you were to try this, definitely spray the crock pot with non-stick spray, and maybe stir the meat into the potatoes, then they won’t brown. Are the potatoes crunchy at all on the bottom? No it turns into a single potato layer, it’s quite delicious, but not crunchy. Could I substitute the sour cream with plain nonfat Greek yogurt? 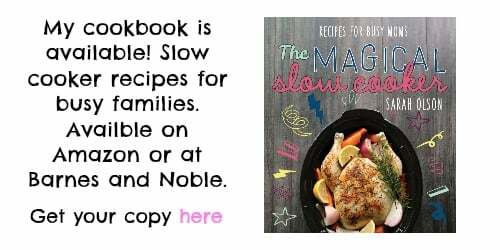 I’ve tried a few slow cooker recipes with nonfat Greek yogurt, it tends to melt and disappear. I think light or nonfat sour cream would hold up better. Good to know about the greek yogurt, I like fatfree sourcream, have used it for years in the slow cooker. I think it would taste great by cooking in the oven. I haven’t done it in the oven before, so I don’t have the time or temperature info. I bet this would be delicious with corn chips instead of tater tots for a crunch! But this sounds delicious! Will be making it soon! Thanks. I have never, ever, ever bought/eaten tater tots. Not my thing. I might try another posts suggestion of corn chips instead of the tater tots or maybe hash browns? I’ll try this! I make a tater tot casserole in the oven! This would be much easier to manage! I’m thinking of throwing in some rotel tomatoes! That sounds like an awesome idea. I’ll try that next time. I am allergic to sour cream.I sub usually miracle whip I,am wondering if that would work here. I am also allergic to ricotta. Do you have any suggestions? Thank you. This sounds so good. I can’t wait to try it! Thanks for sharing. Love the Tillamook cheese factory. Have been there many times over the years. Definitely a fun place to visit! I had a recipe a few years ago that had hamburger in the crock pot, uncooked. Why can’t we do that? We do it with every other meat. My recipe calls for mashed potatoes instead of tater tots. Would that work in a crock pot? I would spray the slow cooker with nonstick spray, and reduce the cooking time to 3 hours. Since everything would already be cooked, you just need do Heat it through. I hope this helps. What size Sour cream do you use? I used one cup. I used half a 16-oz. container. Can you make this for a larger crowd and bake in a slow oven? Say 300 deg. I’m really excited to try this, It’s like my tater tot casserole that I do in the oven but I’m really excited about not having to heat that up on a 90 degree day like today! 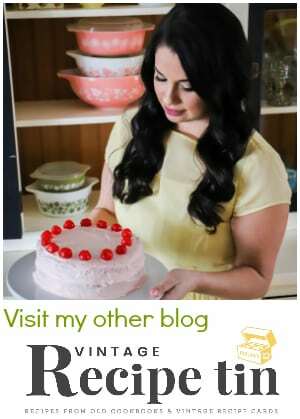 Thank you for your post, It was a nice change from all of the pulled porks, bbq chickens and soups that crowd pinterest! Ah thanks Kati! 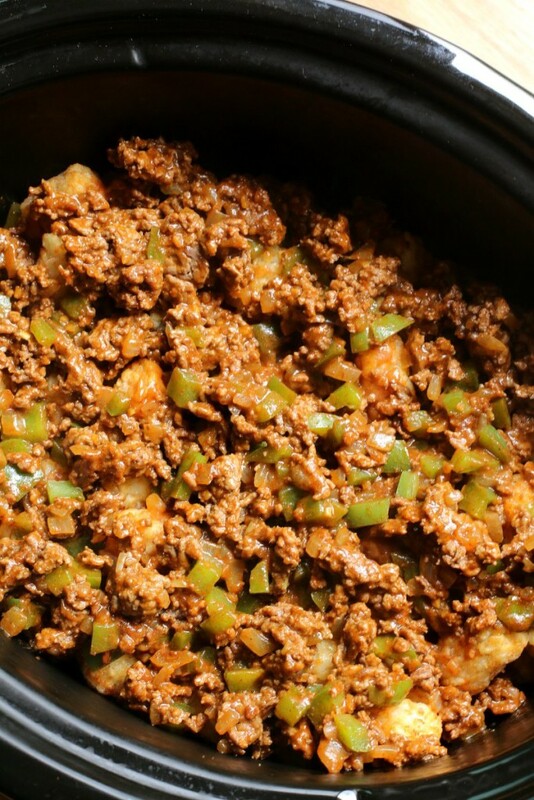 I agree this recipe is such different than most crock pot recipes around! In the crockpot right now. 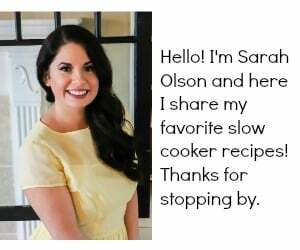 Sunday slow cooker at my house! If you add the rotel and ranch style beans do you need to drain either of them? It made this dish yesterday for the family and it was a HUGE hit! Seconds all around! YUMMY! Thank you for the great recipe! I’ll be trying more for sure! What if you don’t like tater tots? What could you substitute? The original recipes use bisquick, but I am unsure how that would work in the slow cooker, and how long the cook time would be. Choose a different dish. LOL. I can’t understand why you want to change a good dish. Sounds delicious!!! Great recipe!! Yes, Sarah is a saint – such positive responses to crazy posts. Made this once as written…but in oven. Was great. This time using low fat ground turkey instead. Tator Tots are cooked before being frozen. I want to try this recipe, but I broke my slow cooker and have not been able to get a new one yet. I am going to try it in the oven tonight. I’ll try to remember to get back with you on oven temp and how long it cooked. 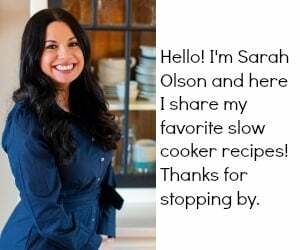 It sounds delicious and I’m always looking for new recipes for my family. Could I use a can of Rotel instead of the onion, bell pepper and tomato? Somewhere buried in all the comments I saw someone did that and they said it turned out great! I think it would be a great addition. Made this for Christmas Eve, it was devoured! Everyone loved it. Perfect for cooking while at church, Sunday morning as well as Christmas Eve. I also want to make an oven version, but don’t know how long to cook. I definitely want to use tater tots, not biscuits. Any ideas? Allergic to cheese. Could I omit that ingredient???? 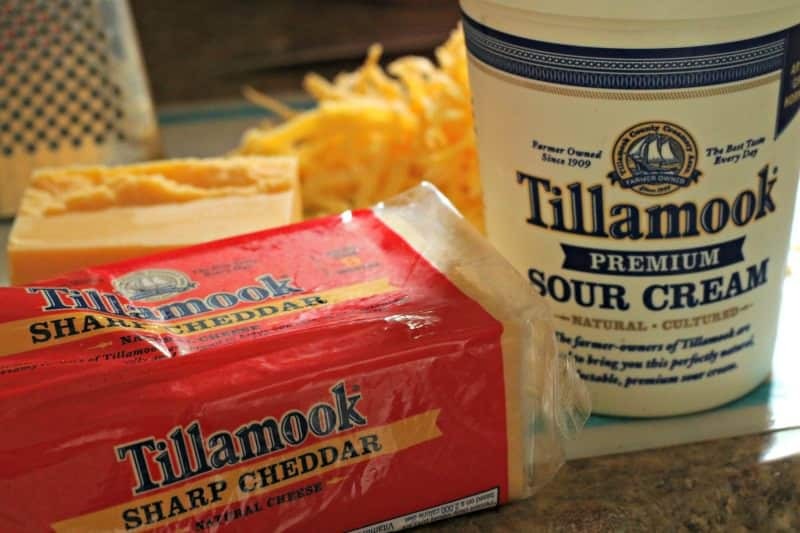 We love Tillamook cheese. We are originally from Oregon, but now live in Georgia, and we can’t get it here….and they don’t ship. Visited Tillamook last September….and brought home a couple of blocks in my suitcase. Wish we could get more…its the best cheese ever! Will make this recipe for sure, but will have to substitute a lower quality cheese. Too funny! It is the best cheese ever. And their ice cream is so good too! Can I sub out tots for diced up potatoes? Would it cook/taste the same? It may be ok, the tots are fried, so they have more flavor. It would be worth trying though! I love this recipe but I make it in the oven and use tator rounds not tots..The rounds are half the size of the tots a d I like the bottoms a little crispy… And I probably use to much sour cream lol…but this is a regular on the menu now and everyone loves it..
I’M IN, SOUNDS MARVELOUS! ! Would it work if you cooked it for 8 hrs (low) in the crock pot? I think that would be too long. Yes! At the cheese factory there a line of cheese tasting with most of those cheeses! you can order a select few of their cheeses from that website amazon also sells them but they seemed rather pricey. I couldn’t fit all if the tater tots in. I had to leave about two handfuls out, otherwise the slow cooker lid would not close at the start of cooking. How did this turn out Tara? I don’t think you used a 6-quart so cooker, you can see in my photos I still had a few inches of room with the 6-quart. I hope it did work for you though! Love the recipe idea! Would it be possible to use my programmable “casserole crockpot” ? I think so! Since it is a casserole meal. My advice is to keep the lid on the entire cooking time. Could I use french fries in place of the tots?? I don’t know how that would work. The tots work well because they are browned slightly before they are frozen. I’m thinking the fries may be bland. My husband doesn’t like green peppers. Any suggestions for a substitute? I love them! Maybe mince them so he doesn’t really see them? Or maybe a green chili mix? I’ve made regular John Wayne casserole and I am excited to try this. The tater tots are a good substitution for the crust on the bottom of regular JW casserole. One thing missing, however, is the jalapenos. I’ve always thought they gave the casserole a lot of flavor. They could be used as a garnish I guess if there are people eating the dish who have a sensitivity to peppers. Sorry, tried this and would not try again. my slow cooker quit on me last week so I’m making this in a 9X13 pan and will cook it in 1 hour I think! I am doing a low carb diet I wonder how it would be without tater tots? Trying this tonight! Only had about a quarter bag of tater tots in the freezer, so I added some seasoned curly fries… figured potato is potato… Haha! I’ll see how it turns out! How did this turn out? I’m so curious! It turned out just fine! Didn’t cause anything to go wrong and the family enjoyed it! I made this in the oven. I cooked it at 350 F for 45 mins covered with foil and then took the foil off and cooked it for 15 mins more. It was a little dry so next time I might add a can of diced tomatoes or rotels. The reason I cooked it so long was I wanted to make sure that a whole bage of tater tots got cooked in a 9×13 pan. But all in all it was really good. I’ve made this several times – for family at home and for church pot lucks. It’s delicious, and everyone LOVES it every time! so great to hear Annie! Hi, Delores. My newly added recipes now have the nutritional info. This is an older recipe. I am working slowly on getting them all updated. I made this John Wayne casserole and I was amazed at how crispy the tator tots got. I will use a low sodium taco seasoning next time. I loved this dish. I am trying this today but I only have shredded hash browns, and had to substitute salsa for the taco mix and water. It is cold out and the Eagles game is on so I am too lazy to go to the store. Let’s see if it turns out ok! Let us know how it turned out with the hashbrowns! Such an amazing recipe!!! We loved it!! Thanks for sharing!! Glad you enjoyed it Stephie! I need to make this again soon.